I don't care if Blair Waldorf says the bow should go on the right--with my new hair-do, it really looks better on the left. That's right, I cut my hair again. Somehow, I chopped more off of my already chopped off hair. Here's what happened. I watched the Grey's Anatomy finale. The first person killed was (SPOILER ALERT) Dr. Reed and I immediately realized I wanted to pay tribute to her through copying her haircut. 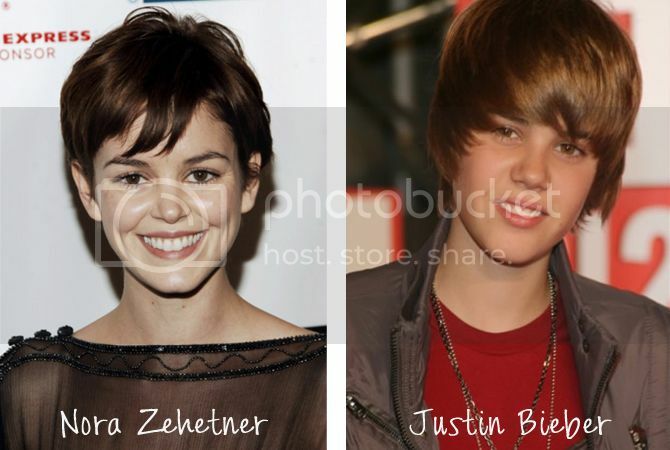 I googled a million images of Nora Zehetner and decided that was the look I wanted to emulate. That, or Justin Bieber. 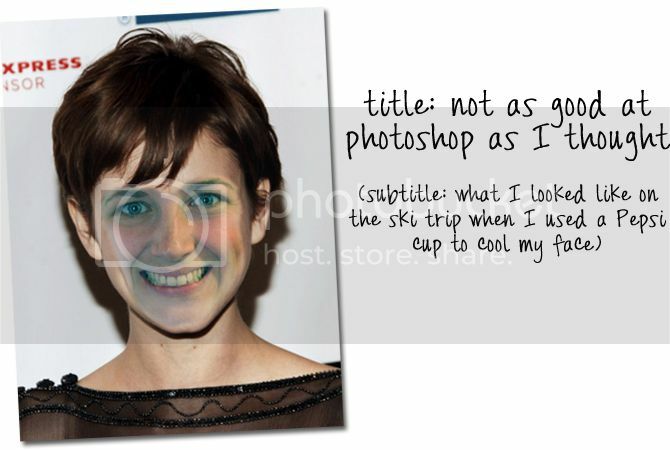 And then, Courtney suggested that I photoshop the haircut onto my face so I would know what it looks like. I failed at that. Apparently, I'm not the photoshop wonder I thought I was. After a long inner-debate and a discussion with my hair stylist, Dominique, we decided that if she thinned the heck out of it, the style would work. So off it went. Responses from the eighth graders have been generally positive. One student told me it was "gorgeous", some walked by me and giggled in their 13 year-old awkwardness. One said, "I like it. It's puffy." Another asked me if I had any dance moves (I'm not sure if this is related to the hair.) And one sweet 7th grader told me he liked the old haircut better, and I think he thought that was a compliment. My verdict? I really like it. It takes even less time to do than the old hair--which was a LOT less than the really old hair. And it's kind of funky. Oh, and if you have any headbands you don't wear anymore, send them my way. Dominique told me that I have to wear makeup and accessories. So I'm working on that. Best blog ever. And I'm not biased. I tell you when your stuff stinks. no offense taken. I think I like it. Will render my official opinion when I see you in slightly over TWO WEEKS. Super cute, I wish I could pull it off! Cute. I have some headbands to send your way...it just might take a few months for them to make it there from my war-zone island home. It looks great! I'm glad you went for it. oooooo adorable. love love love the white headband!!! p.s. I just looked at it again and you are wearing a "previously on LOST" shirt. love. next time go for Justin Bieber. I have a theory that he actually has no hair on the front half of his scalp and that's why all his hair is pushed forward and to the side like permanent whiplash. Wow. Commenting about your hair is a very popular hobby. make up not necessary. you may have given me courage to do something outstanding with my pointless mop of hair. Jealous of your super cute short hair. Excellent job by your stylist. seriously so cute. i am growing mine out...dang it. love the bows. Like it much! Don't think many would mistake you for 50's age group anyways. You always have the courage to chop your hair off. Love it! When I think of Rachel, I think of short hair. That long hair you had during your Boston years really threw me off :). (But of course, it was beautiful too).